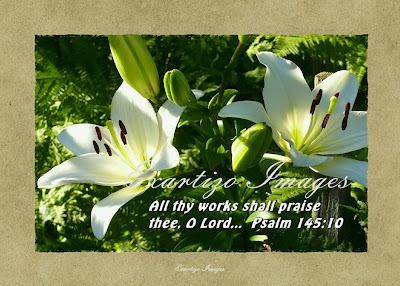 Exartizo Images: The Lord is Good to All! The Lord is Good to All! Have you read Psalm 145 lately? Wow! He is good to all! Who wouldn't want to know our God? What is there to be afraid of? His tender mercies are over all His works. Who would want to turn their backs from that? He is gracious. He is full of compassion. Have any of these words struck terror in any one's heart yet? Gee, He is even slow to anger. I am really glad He is my God. OK, I know some of you are thinking about all the nasty things that happen in this world. Excuse me my friend, ever hear about the god of this world? Notice I used lower case g? We do have an adversary and it isn't our God. Take a look at 1 Peter 5:8; your adversary the devil is seeking whom he may devour, but let's not spend much time on him. I haven't mentioned the beauty He put around us. See those beautiful Moon Lilies up there? I sure did not make them. I had the joy of taking a picture of them. Then my husband utilized a little graphic design so we may use it as a card. We place the card on our night stand and other places throughout the house. Then we have the privilege of remembering His goodness when we rest our heads on our pillows or send it to a friend to encourage them through life's journey. Because the Lord is good to all, all thy works shall praise Him.